Modera Central by Mill Creek was awarded Top Luxury Project for 2019 in the Orlando Business Journal’s Residential Real Estate Awards. Bishop Beale Duncan’s Retail Team is handling leasing for the ground floor space of this development. 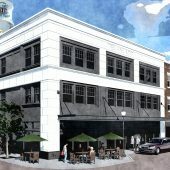 They are targeting various retailers looking to enter the downtown market. Learn more about the award-winning apartment complex in the Orlando Business Journal.